Former West High School graduate Megan Shupert-Martin fields her spot at catcher. The Shawnee State softball program picked up another sweep on Monday afternoon over Ohio Christian as the Bears downed the Trailblazers, 6-2 and 3-0, in a doubleheader that was held in Circleville. SSU would take an early lead in game one. With one out in the top of the first, Katlyn Gleich collected a double and scored on Marisa Brown’s single up the middle. The Bears moved Brown to third but were unable to score her as SSU ended the first with a 1-0 lead. After four scoreless innings, the Bears blew the game open in the top of the sixth. Kayla Koch led off the inning with a single, and was replaced by pinch runner Morgan Rearick. Stacy Trenholm then reached on a bunt single to put two on with nobody out. 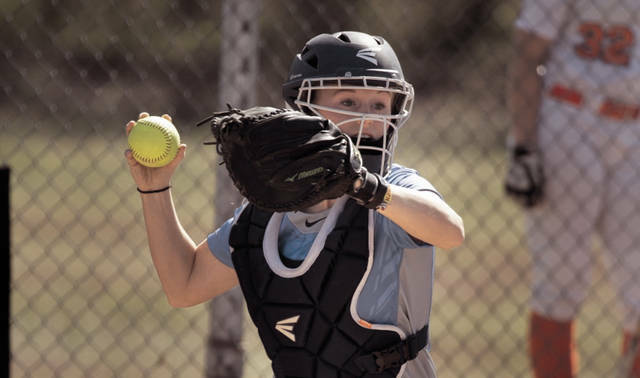 Tatum Wise followed Trenholm with an RBI double to left center field, scoring Rearick and putting runners at second and third, and Maureen Wolansky followed with a single through the hole at shortstop to score Trenholm, moving Wise to third. After Wolansky stole second, Victoria Bevington reached on a bunt single of her own, scoring Wise and moving Wolansky to third. A double steal attempt ended with an error by Ohio Christian catcher Caroline Rice, allowing Wolansky to score and Bevington to reach third. Haley Rawlins (SO/South Point, Ohio) drove in Bevington with a sacrifice fly, ending the scoring and giving Shawnee State a 6-0 lead. Ohio Christian rallied in the bottom of the seventh for two runs. With one out, Whitney Fiedler singled and was replaced by pinch runner Kayla Phipps. Rice followed with a walk, putting two on with one out. McKenzie Whittaker (JR/McDermott, Ohio) then committed a wild throw, moving both runners up into scoring position, and a second throwing error by Kayla Koch allowed Phipps and Rice to score as the lead was cut to 6-2. However, Whittaker closed out the contest by getting Lauryn Rutan to fly out. Whittaker allowed two hits in seven innings of work and struck out four to pick up the win. Whitney Fiedler took the loss, allowing six runs on 13 hits in seven innings. Shawnee State again took an early advantage in game two as Michal Cunningham walked to lead off the game and reached second base on a steal. With one out, Marisa Brown singled to drive in Cunningham, which gave Shawnee State an early 1-0 lead after an inning of play. The Bears scored two more runs in the top of the second inning. With one out, Bailey Kemp and Megan Shupert-Martin hit back-to-back doubles, which allowed Kemp to come home. Cunningham then singled down the right field line to bring home Shupert-Martin and give SSU a 3-0 lead after two innings. From there, the game became the Tatum Wise show. Wise went the distance for a complete game shutout, allowing no runs on four hits in seven innings, striking out five and picking up the win. Rachel Kennedy allowed three runs on 10 hits to take the loss. The wins improve Shawnee State to 12-4 on the season. Ohio Christian fell to 7-9. Shawnee State softball opens Mid-South Conference play on Friday, March 23 when the Bears take on Cumberland (Tenn.). First pitch is set for 3 p.m.